← Chocolate Chips, Granola Pecans and Baked Feta?? OH HAPPY DAY!! Nope. ‘Peelin’ the Pomegranate’ is definitely NOT a euphemism. Wish it was…but alas, it’s not. 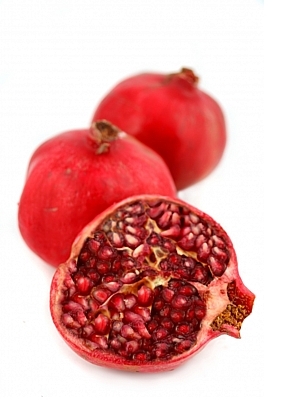 THEN – low and behold – in my inbox was this blog post revealing a SUPER DUPER easy way to peel a Pomegranate! 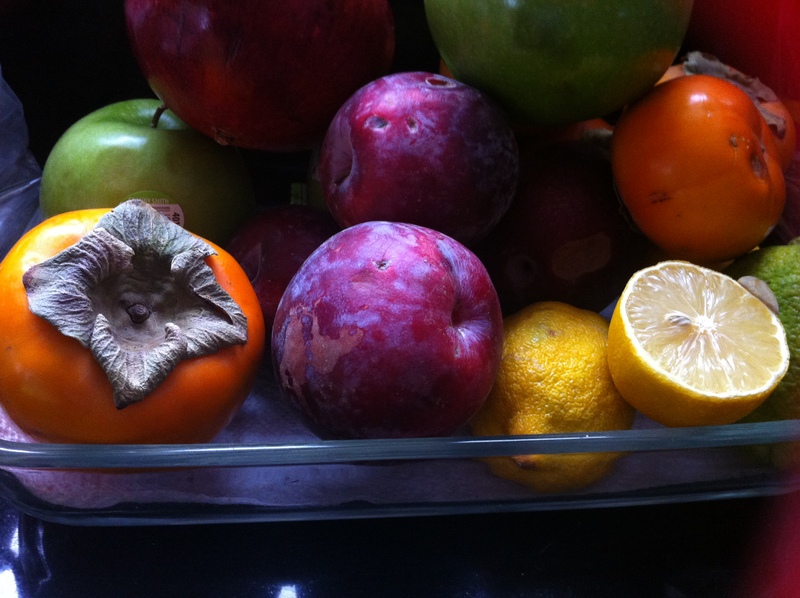 You cut off the ‘flowering’ end, score the whole thing, drop it into a bowl of cold water, then peel away the pith. Seriously easy and – best of all – NO STAINS ON MAMA! I’ve been thinking about how to use the fruit…sprinkle on top of pasta? Serve with chicken nestled in little heaps? Mix with fresh pineapple and dollop with whipped cream? Oh the possibilities! Tonight was a low-key food night as I’m busy prepping Make Ahead Turkey Stock for next week’s Gravy, returning library books, hunting online for affordable car seats and dealing with teething babies. Instead of showing you photos and recipes of YET ANOTHER Pasta with Garlic and Oil with Roasted Cabbage and Chickpeas, I’ll show you what I made 2 nights ago: Rustic Mushroom Tart and a whole bunch of Homemade Applesauce. 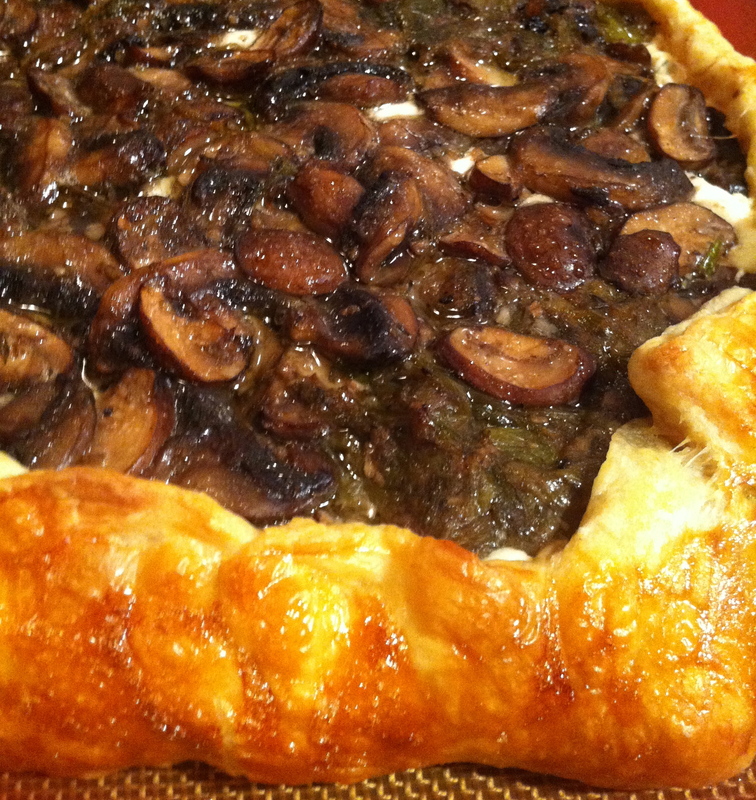 My version of the Mushroom Tart came from Perry’s Plate, who in turn got it from Carla Hall & her new cookbook. It was good…but I think a little too…I dunno. Not enough of something. 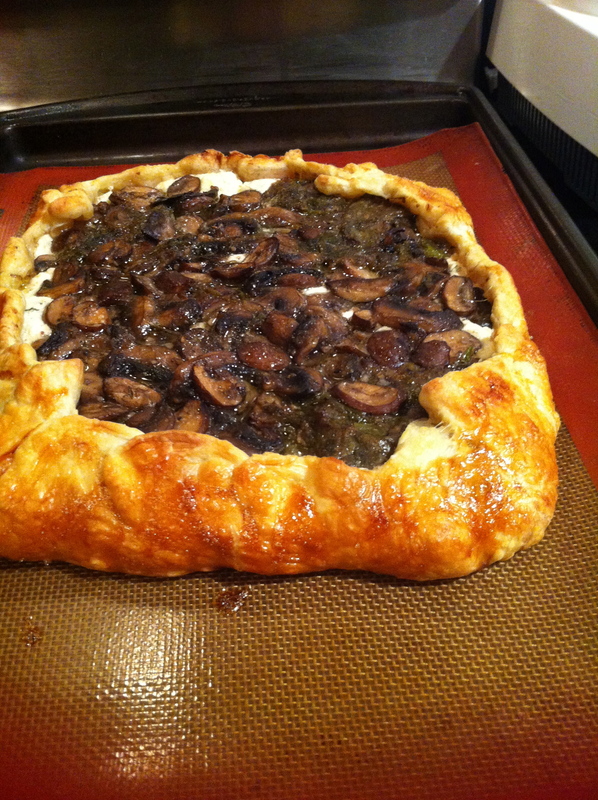 You lay out a dough/sheet of puff pastry, top it with a mix of Ricotta, Goat Cheese, Parmesan and Rosemary, top that with a bunch of sliced, sautéed mushrooms, then bake it off until you wanna swoon with mushroomy joy. Except, well, the goat cheese wasn’t tangy enough, the parmesan wasn’t present enough, the rosemary wasn’t even noticeable. C and I discussed it at some length. I think next time I make this I’ll sauté the mushrooms the same way again (I used stock instead of white wine – it does NOT count as a substitution! The recipe suggests it. So there). So I’ll make the mushrooms the same, but I’ll either nix the ricotta or the goat cheese…probably the goat cheese as I don’t need the tang to compete with the mushrooms, plus it’s more expensive and I’m cheap. So I’ll lay out a mix of ricotta, double the parmesan and double the rosemary, then the mushroom mix, then sprinkle more shavings of parmesan on top. The saltiness of the melty parmesan will help finish the dish I think. Oh, on second thought, maybe I’ll nix the leeks too. I used them this time because I had them from the garden. I think either a nice red onion or perhaps a few shallots would be good. OOH OOH! Maybe even a roasted onion?? Am I going a little TOO crazy? Ha. I amuse myself. So. The applesauce. 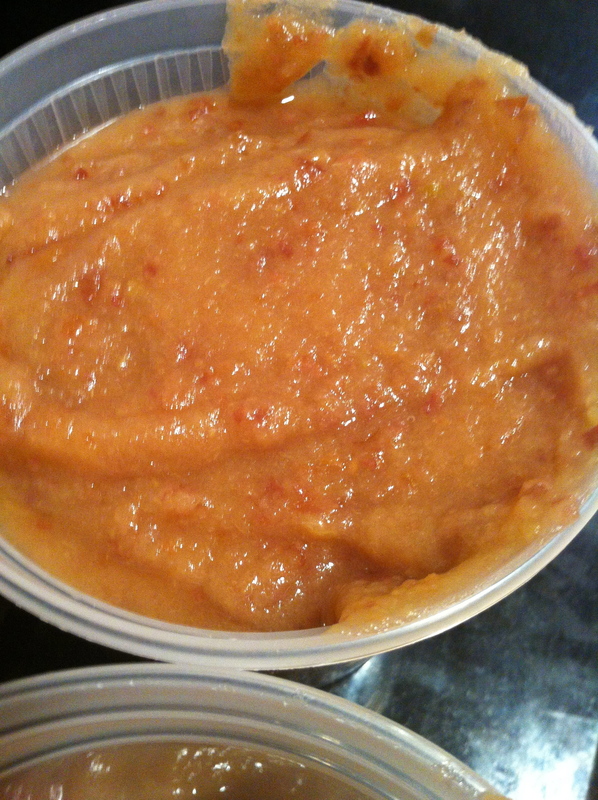 Here’s the thing – I’ve been making applesauce for years and years, but I have no idea where I learned how, nor from whom. My preferred method is to wash and peel apples, core them and cut them into chunks. I lay them out in a baking dish of some kind, add a little water, cover with foil and bake at 350° for an hour or so til it smells delicious. I take the foil off and set the dish aside til it’s cool enough to handle. Then I ladle/pour the apples and liquid into the food processor and whurzzzz away til it’s a consistency I like. Pour the sauce into containers and either refrigerate or freeze, depending on how much I’ve made and how soon we’re likely to eat it. 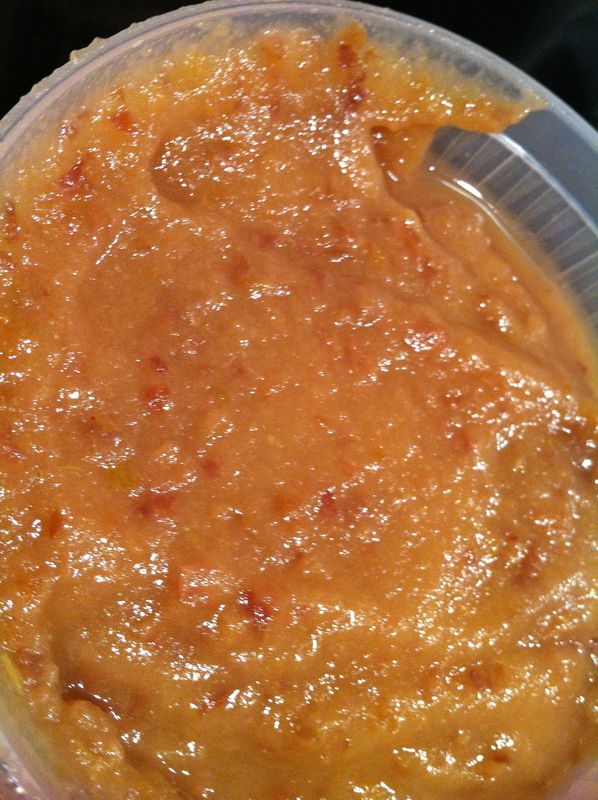 It freezes beautifully and is a PERFECT baby food, should you be so inclined to make your own. Of course, several non-babies in our household have been known to request big fat bowls of the stuff. This makes me quite the happy happy mama! 1 medium leek (white and pale green parts only), trimmed, cut in half lengthwise, then into thin half-moos, and thoroughly rinsed **I used half a dozen little bitty leeks from our garden. 2- In a large bowl, stir together the ricotta, goat cheese, Parmesan, rosemary, and 1/4 teaspoon pepper until well mixed. 3- In a large skillet, heat the butter and oil over medium-high heat until the butter melts. Add the mushrooms, leek, garlic, and 1/2 teaspoon salt. Cook, stirring occasionally, until the mushroom juices release and evaporate and the mushrooms start to brown, about 5 minutes. Add the wine (or stock), bring to a boil, and simmer until it evaporates. Season to taste with salt and pepper. 4- On a large sheet of parchment paper, roll the dough into a 12-inch round. Slide the parchment paper with the dough on it onto a half sheet pan. **Silpat was used instead of the parchment paper. 5- Spread the ricotta mixture evenly over the dough, leaving a 2-inch border. Spoon the mushrooms in an even layer over the cheese. Fold the border of the dough over the mushrooms, pleating the dough every 2 inches. Immediately transfer to the oven. 6- Bake until the crust is golden brown, about 25 minutes. Grate the lemon zest directly over the mushroom filling and rizzle with a little olive oil. Cut tart into wedges and serve immediately. **The amount and types of apples you use can vary. If you feel like it, use a whole mix of apples or just one type. I usually try to make at least a dozen apples at a time – which yields about 2 quarts of applesauce. You can make bags and bags of apples at a time if you like – and have the freezer space to store the extra. 2- Wash apples and cut into chunks, throwing away the cores and stems. If you’re so inclined, feel free to peel the apples too. I usually don’t. But I’m also really lazy. Up to you! 3- Lay out the chunks in a deep casserole or baking dish. Add some water – just enough so the apples won’t stick to the pan while they cook. 4- Whack the pan into the oven and leave the room. When you can smell the apples (in about an hour to an hour and a half), check them by poking with a knife. If the apple pierces easily, and they look like they might start falling apart, they’re done. Let cool. 5- Transfer apples and liquid into either a blender or a food processor. Puree until you like the consistency (if it’s too thick, add a little water – a Tablespoon at a time). Pour out into airtight containers and store in fridge or freezer. Enjoy!